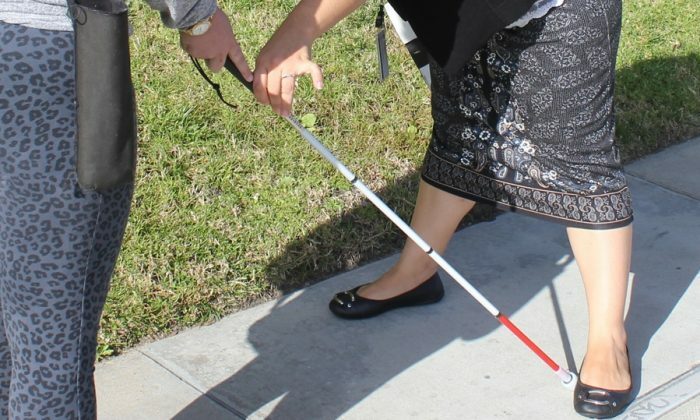 Orientation and mobility (O&M) training is highly specialized instruction that prepares persons with little or no vision so that they can move freely about their homes and neighborhood and travel throughout the community independently and safely. Gricelda Pena is a Certified O&M Instructor, who works at the Dayle McIntosh Center (DMC). She loves her job, because she believes that orientation and mobility skills are essential tools for consumers without sight. 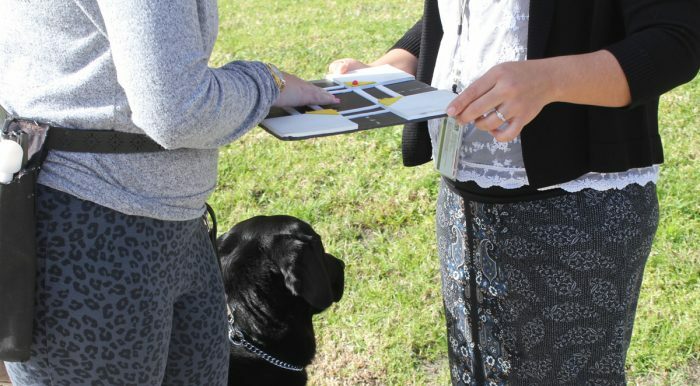 Orientation and mobility instruction is specifically targeted to persons, who are blind or partially sighted. 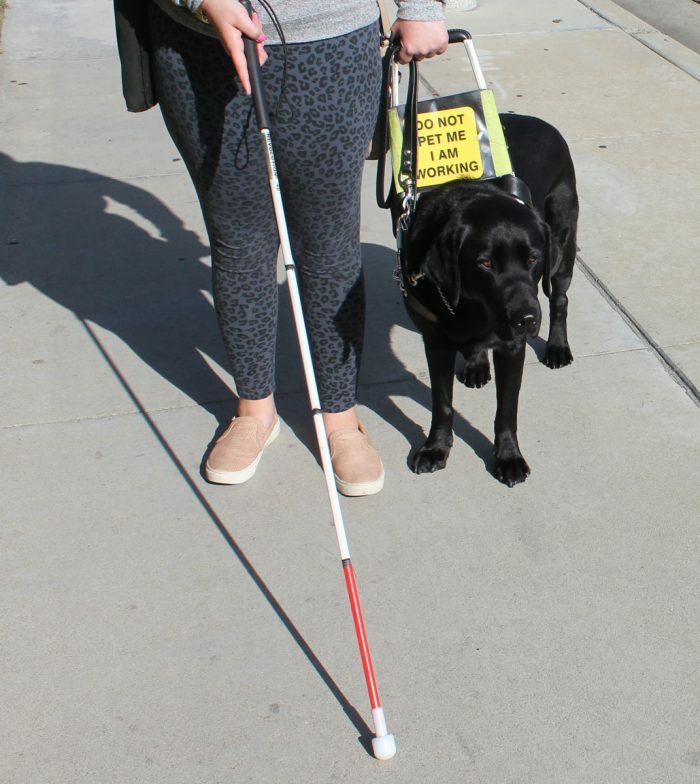 While some consumers may have secondary disabilities, vision loss is the primary focus of O&M training. For more information about O&M training please call 714.621.3300 or complete the online form. Most individuals are referred for orientation and mobility training through the Department of Rehabilitation. Other organizations may also make referrals to the program and individuals may request services themselves. 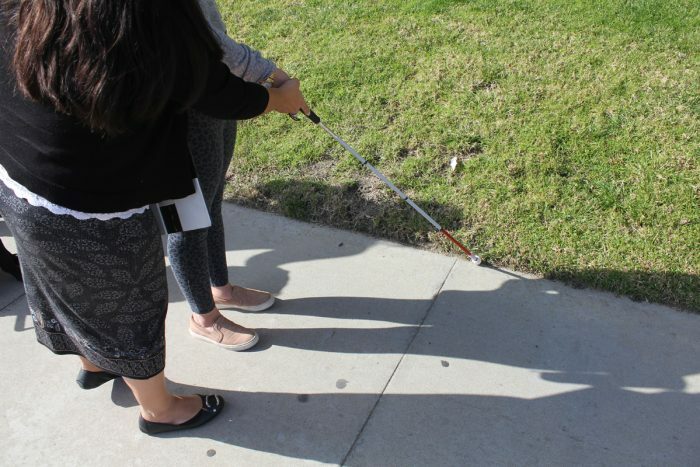 Basic Skills such as walking with a sighted guide, retrieving dropped objects, using escalators and elevators, and social graces including seating oneself, shaking hands, using mannerisms like eye contact, keeping one’s head up, and soliciting assistance. Cane Skills such as knowledge of white cane laws, identification of parts of the cane and its uses, and instruction in cane travel techniques. Indoor Skills such as directional turns from 45 degrees to 360 degrees, location of intersecting hallways and open doors, navigating furniture, using auditory clues and landmarks, and understanding parallel and perpendicular references. Outdoor Skills such as defining a block, street patterns and immediate surroundings, traffic, landmarks and cues, distinguishing between streets, driveways, curbs, and alleys, and using sun direction as an aid to orientation. Travel Skills such as mobility techniques in residential areas, business and shopping areas, street crossings, railroad tracks, parking lots, and use of taxis, buses, and light rail trains. Orientation and mobility instruction is provided for a consumer until the desired outcomes have been reached, for example, the consumer demonstrates the ability to travel to and from a job site successfully. Occasionally, a consumer may decide to withdraw from the program or may move out of the DMC service area, which also results in case closure. Following services, consumers have the opportunity to complete a satisfaction survey in order to express their opinions of the effectiveness of the O&M program. The Orientation and Mobility Instructor worked with a woman, who had been blind for two years, because of diabetic retinopathy. The woman was afraid to leave her second-floor apartment for fear of becoming lost and disoriented. The consumer did not know how to use a white cane for safe travel. After only a few O&M lessons, the woman was able to use the location of the sun as an aid for orientation and a cane to navigate down the stairs. The consumer stated that O&M skills had given her a sense of independence. She enjoys sitting in the courtyard on a beautiful morning with the assurance that she can find her way back home. Although the consumer has more to learn, she is now motivated to continue to develop her O&M skills for more freedom in her everyday life.